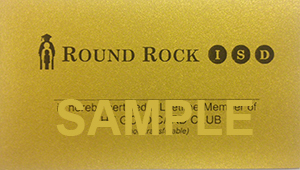 The Round Rock ISD Senior Gold Card is available to residents of Round Rock ISD who are age 60 and older. It is our way of saying “thank you” to the many years of contributions you have made to our schools. The Senior Gold Card offers the bearer a lifetime of free general admission to all Round Rock ISD events that are open to the public, including: regular season athletic contests or performances of theatre, dance or musical organizations. Please note: This card is only valid at Round Rock ISD events and cannot be used to gain free entrance at events hosted by other districts or entities. The card is not valid for free entrance at any UIL playoff games. This card is not transferable. To obtain a Senior Gold Card, visit the Lillie Delgado Administration Building, 1311 Round Rock Ave., Round Rock during business hours. Proof of age and residency within Round Rock ISD must be shown in order to obtain a card.